The gravity bong at its most basic level is nothing more than a weed smoking device designed to use the forces of gravity to pull down the weed smoke into the smoking chamber by way of water. The water works with gravity to condense the smoke into the chamber so when you take a rip, you really are going to feel it. The can be purchased from retail outlets or you can make one yourself quite easily and enjoy all the benefits of a thicker, stronger, and powerful hit. Today we will discuss the difference between gravity and bucket bongs, the benefits of store-bought bongs, and how to build your own gravity bong from scratch. Gravity bongs are available in two different styles, the waterfall bong and the bucket bong. Each offers the user two different smoking experiences and function differently. The following information will give you a better understanding of why weed smokers prefer one over the other. The traditional bucket bong on a basic level is is comprised of two separate containers, a larger open-top container and then a smaller container. The larger of the two containers is filled up with water, then the smaller container is placed inside the container filled with the water. Once the bowl is backed with herb and lit, the user moves the smaller container upward, which causes a significant change in the pressure. 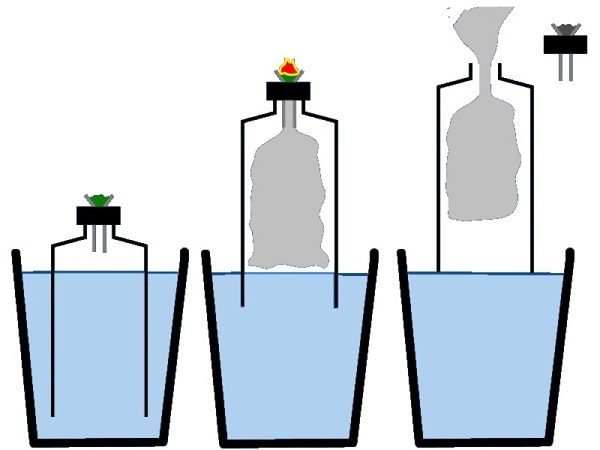 Once the pressure changes, the smoke rushes into the smaller container as water, gravity, and pressure work in unison to send the smoke to the smaller container. The bowl is removed from the smaller container, then you enjoy a thick, long, powerful hit while pushing down on the top bottle to get a rush of smoke right to your lungs. The traditional waterfall bong is comprised of only a single container, but the end result is the same. To enjoy a thick rich powerful hit of the sweet smoke, the container used in the waterfall bong must have a bowl and the tiny hole near the base for water drainage. As the water begins to flow out of the container, what is going to happen is air will be forced through the bowl and will cause the weed to then burn and fill that container with an abundance of smoke. The smoke-filled container is stuffed with plenty of powerful herb essence to get you ripped after a few deep hits. While most savvy stoners can make their own waterfall and bucket bongs with supplies around the house, those who want to utilize superior craftsmanship and make use of the same device over and over opt for the store bought gravity bongs. The biggest difference is these devices are usually made from harden glass, offer easy clean-up, and they don’t utilize as much of your supplies to produce the same thick powerful smoke clouds. That means over the course of a few weeks, the reduction in stash usage will pay for the cost of the gravity bong. The store bought variety of the gravity bongs come in different sizes, so beginners and advanced stoners can rejoice. In addition to conserving your herbs, these high-quality smoking devices are made from durable components that resist breakage. Perhaps money is tight or you possess the skills of MacGyver himself and want to build your very own gravity bong from the ground up. All we need here are some common household items, a few minutes of patience, and before you know it you will have your very own DIY gravity bong. Step #1 – Gather a few household supplies to get the project underway. To make your own DIY gravity bong we will need a two liter bottle, one liter bottle, aluminum foil, scissors, needle, sharp knife or razor blade, your stash, and a lighter. Step #2 – Take the cap off the larger bottle and make a hole in the cap with your knife or razor. Step #3 – Use the edge of the scissors or knife to widen the hole in the cap. A good guide is being able to cover the hole with your pinky finger. The hole is going to act like the bowl of the bong. Step #4 – Tear off a square piece of the aluminum foil, big enough so that when you place the cap with the hole in the center, you will have plenty of foil to work with to wrap around your finger to make a bowl. Step #5 – Use your pinky finger as the guide, and wrap the foil around your pinky so that it will fit in that hole easily and act like the bowl. If the bowl does not sit in the hole deep enough, it will keep falling out of the cap. Step #6 – Place the foil bowl into the hole you made in the cap. Then begin wrapping the excess foil around and under the cap. Roll the cap on a flat surface to smooth out any wrinkles. Step #7 – Use you needle to poke a few holes in the foil bowl. Be careful not to make the holes too big or your stash will slip into the bottle. A good rule of thumb is between 2 and 5 holes, depending hole large the bowl is. Too few holes and not enough smoke will enter the bottle, but too many holes and you risk breaking the bowl. Step #8 – Take the smaller bottle and using your knife, scissors, or blade, cut off the bottom of the bottle. Be sure to leave enough of the bottle because this is going to act like the smoke chamber. Step #9 – Cut off the top of the larger bottle the same way that you cut the smaller bottle, the bottom of this bottle will act like the bucket in a bucket bong. Step #10 – Fill the larger bottle, the bottom half, with about 3/4 full of water. Step #11 – Pack your bowl with your stash, weed, smoking material. Step #12 – Place the top half of the smaller bottle into the larger bottom half filled with water. Screw on the cap, or the bowl. It is very important you screw the cap on after the top half is submerged in the water. If you screw the cap on first and then submerge, the pressure will cause your weed to fly out all over the place. Step #13 – Light the weed in the bowl while slowly lifting the top bottle as smoke fills the chamber. 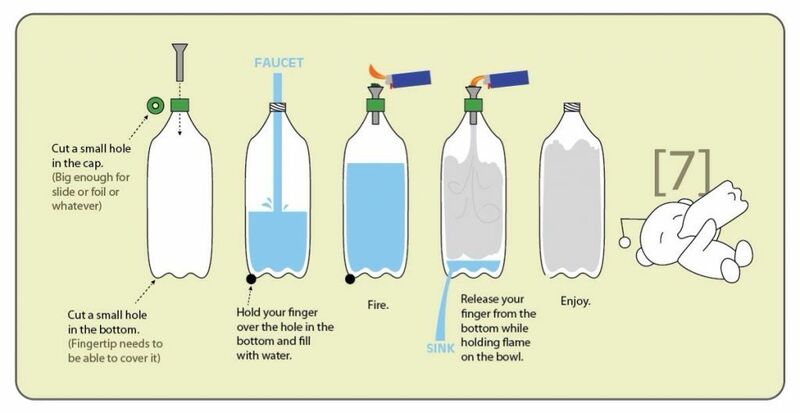 Once the entire top bottle is filled with smoke, gently unscrew the cap, put your mouth to the top of the bottle and take a rip while pushing down on the bottle. Pushing down forces gravity to push that sweet nectar right into your lungs.